In order to fulfill the ever changing demands of our clients, we have been engaged in offering a quality range of Heat Shrinkable Termination. We do not compromise with quality and make sure that finest quality material is used in the manufacturing process. In addition to this, we offer these products in various specifications at industry leading rates. Since the establishment in year 1961, Shree Ganesh Enterprise has been one of the dominating manufacturers, suppliers, distributor & wholesaler of Cable Joints Products. 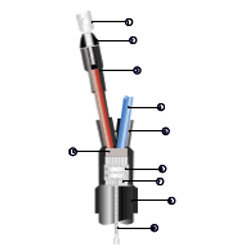 The company offered wide ranges of products with the Heat Shrinkable Cable Joints, Heat Shrinkable Cable Accessories and LV Heat Shrinkable Cable Accessories. We have manufactured products with the application of the finest raw material and the highest technological up gradation and innovation produced in the industry. The products have long serving life and high resistance to operate in high voltage because of the effective quality analysis performed by the organization. We have been ruling in the competitive industry because of the supportive and loyal clientele base developed by the company after working and gaining experience of more than 40 years. We have healthy and close professional relations with all our clients for granting fulfilling the exact requirements with the superbly designed and manufactured products having widespread operational flexibility.